It simply isn’t going to be acceptable for Teachers to say that given a massive reduction in planning time, and a dearth of other world challenges, that we can’t change, we will need to change. It simply isn’t going to be acceptable for Administration to roll out yet another program and another detail and act as if every lesson in all classes can be adjusted. Given Just In Time PBL programs, nope, not a reality. But in the world in between, C.S. Lewis’ “Wood between the Worlds”, there is a need to change both sides. This morning we were presented with a concept of Student Driven Self-Assessment and Goal Setting where students performed an initial Goal Setting, a midpoint Self-Assessment and corrective action plan and a Final Assessment and Scoring. I put it into practice at the beginning of my current project in my Online Video class three periods later. 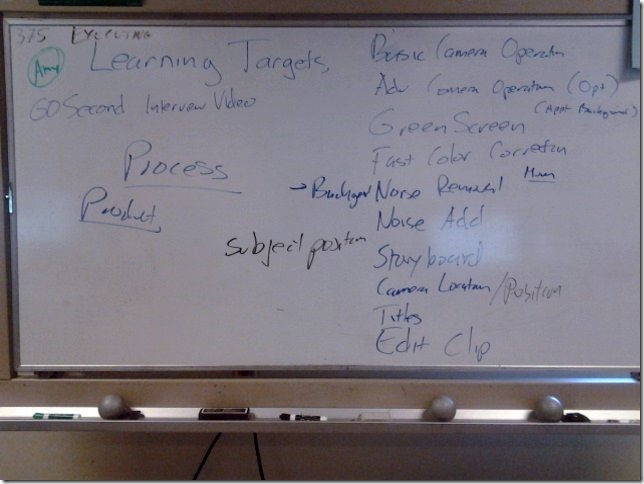 The result of the student driven work is on the white board in the picture below. The following class, same subject, added the two black comment they felt were missing. 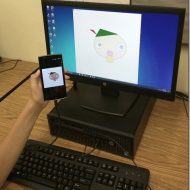 It will be interesting to find out if the students have a clearer picture and a better learning process. There isn’t time to take notes and reflect. One needs to try things when they are fresh and determine from the process if it is worthwhile. Hopefully, a prompt inclusion will also allow administration to see that serious attempts are being made and for all stakeholders to move along the continuum from knowing a little to knowing more. Why Use Infographics? Why is the Sky Blue?